Endowment board unveiled 1939 Mothercraft Home, Tasmania . Who was Nellie Payne? 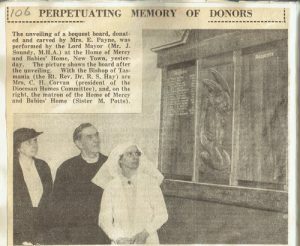 Unveiling of endowment board at Mothercraft Home. Obviously Nellie was a very charitable person, donating many carvings to various organisations over many years. Her daughter, Madge, also worked at the Mothercraft Home and our assumption is that this Home was run in conjunction with the Home of Mercy and Babies Home, and also Clarendon Home. Nellie and Madge were also involved in many fundraising events for these homes. Unfortunately, this board has not been found, and the only photo we have is at the unveiling.